The outstanding quality of the simulation allows you to feel the atmosphere of racing FIA GT3 and join the fight against the official pilots on the cars and tracks of the real championship, recreated in the game with unsurpassed accuracy. With a fantastic level of realism, Assetto Corsa Competizione offers sprint, endurance and 24-hour race formats - in both single player and multiplayer mode. 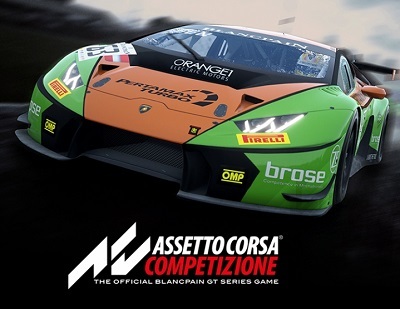 In the Assetto Corsa Competizione will be presented the championship Blancpain GT Series 2018 season. The game will also include the 2019 season, which is expected to be a free addition in the summer of 2019. Thanks to the experience of KUNOS Simulazioni, Assetto Corsa Competizione uses all the capabilities of the Unreal Engine 4 to create realistic weather conditions and graphics, night racing and animation with motion capture technology. All this allows you to set new standards for realism and immersion for racing simulators, including through an improved model of aerodynamics and tire behavior. Assetto Corsa Competizione aims to promote eSports. The game will offer a new approach to racing design and allow participants to feel themselves in the heart of the Blancpain GT Series championship at the wheel of Ferrari, Lamborghini, McLaren and other prestigious racing cars, each of which is recreated with outstanding attention to detail.